This movie follows the lives of five families who rebuild after the great Central Texas flood of 1998. Their stories unfold to show how the rapidly growing Central Texas corridor is the most flash-flood prone area in North America yet few know of the dangers or how to prepare. We see the characters' fate in a massive repeat flood in 2002. 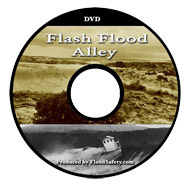 Flash Flood Alley has aired extensively on Texas PBS affiliates since the Spring of 2005. TEC has produced a comprehensive on-line resource promoting flood safety in Texas. Our state regularly leads the nation in flood-related fatalities and property damage. This project explains the predominance of flooding in Texas and what steps you can take to protect your life and property. 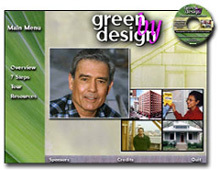 This CD-ROM introduces the concept of sustainable design with a tour of commercial and residential buildings. It also includes a comprehensive guide to the essential steps involved in a successful greenbuilding project. 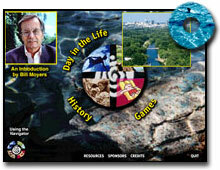 This CD-ROM explores the cultural, scientific, and human history of Barton Springs, a large natural swimming pool that sits like a jewel in the center of Austin, Texas.